Cook rice in 2 2/3 cups water as directed on package. Cover to keep warm. Meanwhile, in small nonmetal bowl, stir together all Sauce ingredients. Set aside. With small metal spoon, scrape underside of mushroom caps to remove dark gills and stems. Cut mushroom caps into 3/4-inch pieces. Spray large nonstick skillet with cooking spray. Heat over medium-high heat until hot. Add mushrooms, onion, bell pepper and garlic; cook and stir 3 minutes. 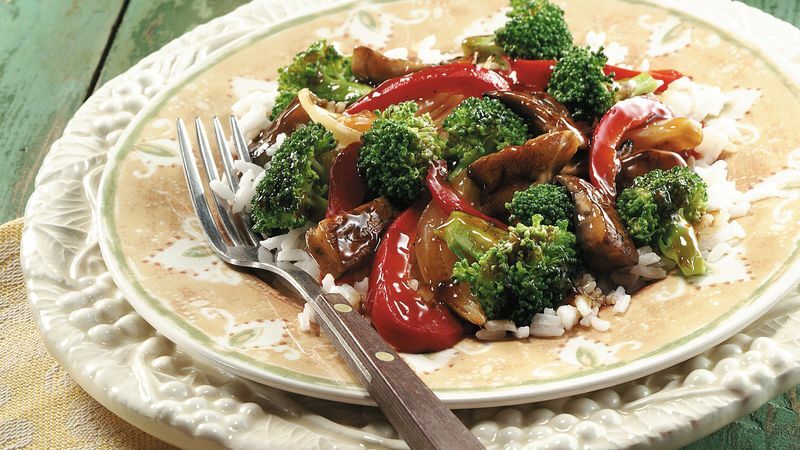 Add broccoli and 1/4 cup water; cover and cook 3 to 5 minutes, stirring occasionally, until vegetables are crisp-tender. Add sauce; cook and stir 2 to 3 minutes or until bubbly and thickened. Serve over rice.